(New York Post, Dec. 13, 2017) – New York City’s longest-serving garbage collector is about to start his 52nd year on the job — and is five years from becoming the oldest city sanitation worker in history. Seventy-five-year-old Joe Caggiano of Staten Island began working for the Department of Sanitation on Jan. 3, 1966 — back when John Lindsay was mayor and garbagemen swept the streets in three-wheel “Wayne” brooms, which had only one rear wheel. Caggiano started out tossing trash into the back of a hopper truck. He now spends most days driving a truck, picking up containers of paper recyclables. 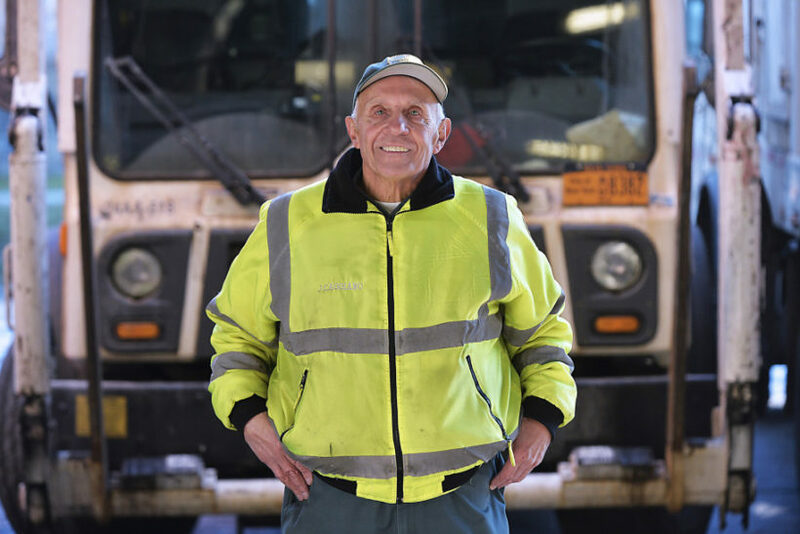 He’s the second-oldest person to work for the city’s sanitation agency — trailing only Louis Gagliotto of Brooklyn, who had 50 years on the job when he retired in 2007 at age 79. Caggiano, in his 52nd year, was eligible to retire and collect a full pension in 1986. But he saw that as the path to an early grave. Before recycling, the old days were less complex, he says, but also less safe, especially on “escalator” trucks that loaded trash on a conveyor belt-like contraption. Caggiano, who began his career as a technical artist sketching city topographical maps, eventually moved to the Sanitation Department’s drafting unit, where he did graphics for the mayor’s office. Twenty-two years into that gig, he was transferred again at the age of 50 to collecting trash, in his home borough. “It didn’t bother me. I was very active outside. I built my own house,” he said. He credits his dad, who worked 37 years for the Sanitation Department, with his work ethic and encouraging him to follow him. Caggiano’s son, Joseph Jr., also works for the Sanitation Department. He’s 50 and with a mere 20 years on the job. (by Ben Hooper, UPI, Feb. 5, 2018) — Firefighters in Georgia said they hoisted a biker and his motorcycle out of a large sinkhole that opened in a road behind a strip of stores. 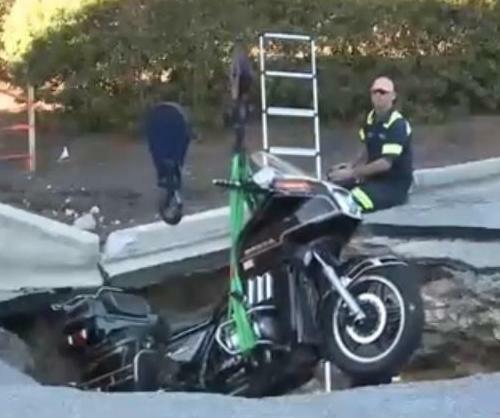 Witnesses said the man was riding on the road behind the Augusta Exchange shopping center when he and his bike plunged into the massive sinkhole on Wednesday. “By the time he saw the hole, he tried to react, but there was not time,” witness Marjorie Wolfram told WJBF-TV. Michael Meyers of the Augusta Fire Department said firefighters pulled the man and his motorcycle out of the hole. He said the motorcyclist was able to avoid serious injury. Augusta Utilities Director Tom Wiedmeier said the hole opened up near a storm drain in the shopping center’s parking lot.